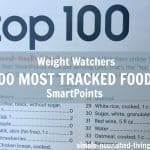 Weight Watchers Friendly Air Fryer Recipes & Giveway! 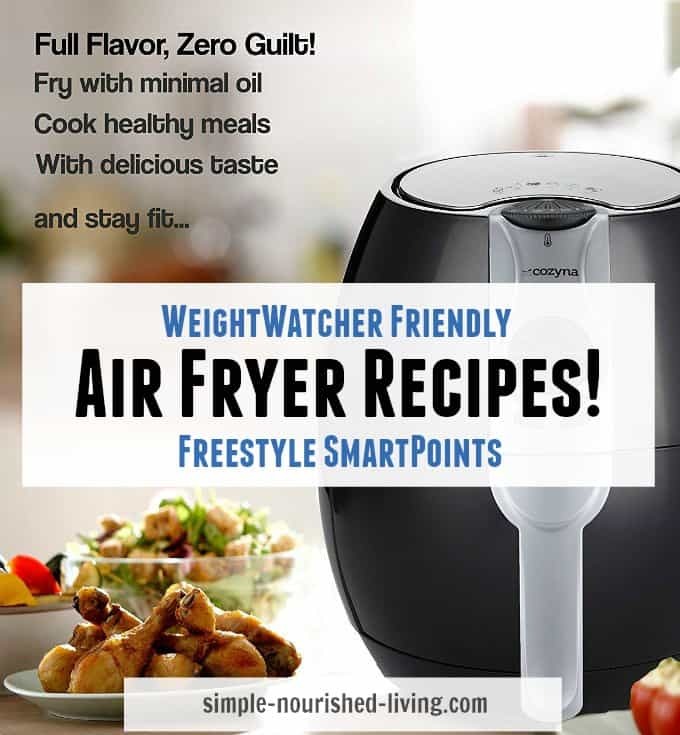 Please contact support@simple-nourished-living.com to claim your air fryer! As a small token of appreciation for supporting this little old blog of ours and in the spirit of the season, we are giving away a Cozyna Air Fryer! You’ll find all the details at the end of the post. 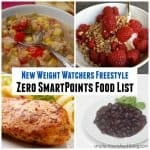 But first a roundup of Weight Watchers friendly air fryer recipes. I’ve received a lot of requests for Air Fryer Recipes. A slow adopter of new technology, I don’t have an air fryer yet and I’m not sure I’ll get one. 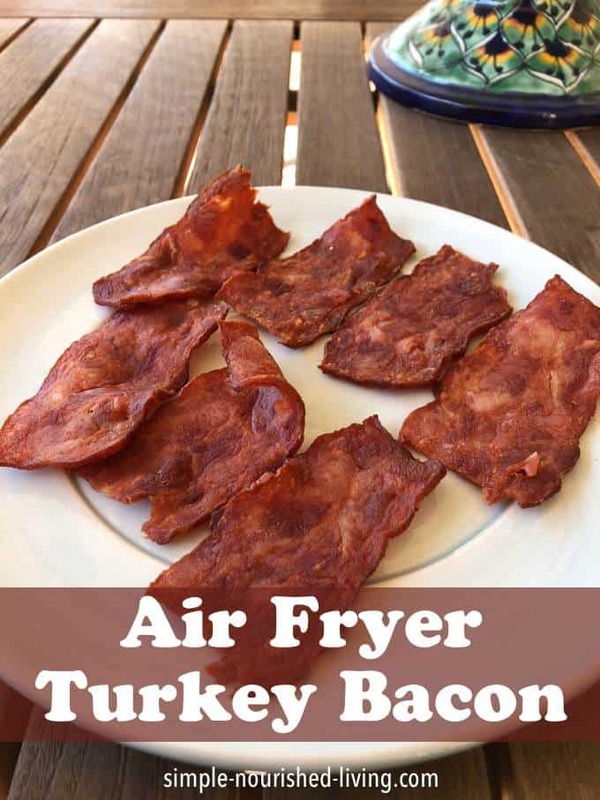 But my brother, Peter, is onboard as he illustrates in this air fryer turkey bacon post, the first of what I hope becomes many air-fryer recipes here on Simple Nourished Living. Have you caught the air fryer bug? We held a giveaway for one last May, which gave me my first appreciation for just how popular this kitchen appliance has become. In the simplest of terms, an air-fryer is a compact countertop convection oven. It uses superheated air to cook foods, creating results very similar to deep-frying or high-temperature roasting. Air fryers use the same technology as convection ovens, but instead of blowing the air around a large oven, it is blown around in a compact cylinder. The result is food with a crispy brown exterior and moist tender interior – kinda like deep-frying, but without all the oil. Air fryers can also be used to bake, grill, and roast. Use it to make Fries, Chicken tenders, Fish Sticks, Cheese sticks, etc. Crispy Air Fryer Sweet Potato Fries (3SP) – Crispy sweet potato fries made in the air-fryer, with just a small amount of oil! Making them in the air fryer is so much healthier than frying, and reduces the fat and calories, without sacrificing taste. 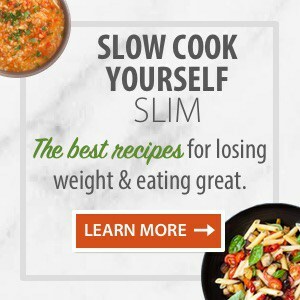 Try our One-Click WW Recipe Search to find your next favorite Weight Watchers friendly air fryer recipe! Now onto the Giveaway… Giveway is Over. Please see winner at the top of this post! If you love the taste of fried food but not excess calories and fat, this appliance delivers. Here at Hungryland, we’ve gotten pretty good at re-creating fried food sans guilt with our own “faux-fry” oven method. But I’ve gotta say, the recipes we tried in our air fryer came out even crispier. It gets better: We tried them with and without a small amount of oil (per the air fryer instructions) and found that NO added oil is needed to achieve that crispy finish. It’s NOT a uni-tasker. I’d hesitate to recommend splurging on a kitchen gadget that can only do one thing. So I was pretty happy to learn that our air fryer can also bake, grill, and roast. I’m talking meatballs, steak… even muffins and cake! The manual includes a comprehensive chart with foods, temps, and times, which I LOVE. It’s a time saver! My oven takes around 10 minutes to pre-heat, but an air fryer takes only about 3 minutes. Plus, some recipes cook WAY faster in an air fryer… My butternut squash fries were air-fryer ready in just 12 minutes, versus the 35 minutes they take in the oven! Clean-up is a breeze. No messy pans or oily skillets. You can toss the fryer pan and the basket right into the dishwasher when you’re done with ’em. Enter The Giveaway Giveway is Over. Please see winner at the top of this post! For me, it is a tie between my InstantPot and Ninja! Winners will be announced next Monday morning. Be sure to check back to see if you won. 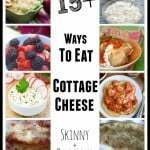 Enjoy reading the comments below from Simple Nourished Living visitors to see other favorite small kitchen appliances or I’m ready to leave my comment! Previous Post: « Weight Loss Success Story #37 – Tanya A. 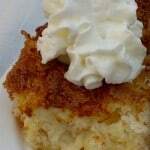 Air fryers are quick and offer healthy options. Well the only small appliances I have a a crock pot and a Ninja coffee maker. (which i just got as a gift from my work Christmas party!) So I guess I would have to say the crock pot because you put the food in and walk away and later it’s all ready! I have wanted to get an air fryer, but just can’t afford it right now. Been hearing so much about it and how much better they are for you. I love my immersion blender to purée soups! It’s so much safer than pouring hot soup into a regular blender. I hear so many terrific things about air fryers and would love one. Thanks! By far I’d say my Instant Pot is my most favorite small kitchen appliance right now. I have cooked everything from cheese cake, stews, BBQ to vegetables. I love my crock pot. I’m dying to use an air fryer. My sister has one and loves it! I like my crockpot and crockpot liners. I use my crockpot more than I used to because of the crockpot liners. These liners make cleanup so easy; I just have to wash to top of my crockpot and throw the liner in the trash. I love my crockpot. There is nothing like walking through the door after work and having dinner ready and waiting! 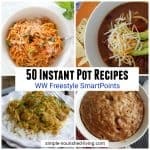 My favorite small appliance is definitely my Instant Pot!!! George Foreman Grill with removable plates. Easy clean up! I use my food processor every day. 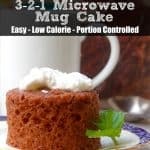 It makes food prep for the week extremely quick and easy. My favorite small appliance right now is Yonanas ! You add a frozen banana and any chopped up frozen fruit for a deli cious sherbet type of treat !! !